PokerNews India: Tell me about the recently concluded Baadshah Gaming Live Tournament in Goa? Madhav Gupta: This was the third edition of the Baadshah Gaming Live Tournament since its inception in December 2017. Given the phenomenal response that we received during the second series in April this year, we wanted to give players another unique experience. With that in mind, and given the fact that we have always believed Baadshah Gaming to be a click-and-mortar business, we decided to conduct the Main Event of BLT both online and offline. The Main Event Day 1 was divided into three flights, with Day 1A been held online on BaadshahGaming.com, while Day 1B and Day 1C were held live at Casino Pride in Goa. This was the first instance of a flight of Day 1 of any event being played online in India and we are excited that this gave younger players with smaller bankrolls the chance to play the Main Event and make it to Day 2 from the comfort of their homes without incurring major traveling costs. We will continue to brainstorm and come up with more such innovations and ideas that directly benefit the players. PokerNews India: Besides 3-4 online operators, most of the poker sites lack action. How hard is customer acquisition in India? How does Baadshah Gaming plan to gain a bigger share of the market? 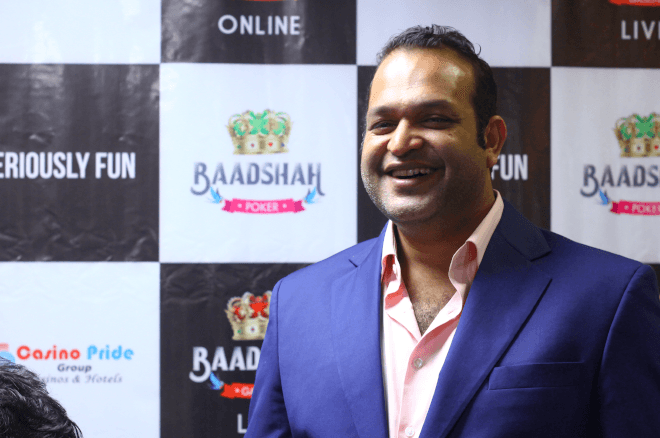 Madhav Gupta: Baadshah Gaming has always believed in putting the interest of our player community before anything else. We ensure that inputs are taken by the player community every time we initiate any policy change, be it for our live or online platforms, with the idea being that this process will allow us to provide the best playing experience for our players. Now we have always been cognizant of the fact the TDS and losses are the two biggest pain points that players in our industry face will playing both professionally and recreationally. To tackle these the first problem, Baadshah Gaming has now revised its TDS policy in that, while our process of calculating TDS will remain unaltered, and we are pleased to announce that Baadshah Gaming would be bearing the TDS on player winnings at the time of cash outs going forward. While we hope that this change in our TDS policy will provide relief to winning players, as a site we also want to look out for losing players as well. Thus, for players who do not opt for the TDS benefit or do not meet the TDS criteria due to net losses, we are providing an attractive rake back program ranging from 25%-40% based on the VIP points generated by them. We believe that as a poker site, Baadshah Gaming must try to protect the ecosystem and this is a step in that direction and will help drive higher traffic to the site. PokerNews India: What’s the relationship between Casino Pride and Baadshah Gaming? Madhav Gupta: I have been operating the Casino Pride poker room for close to 8 years now. After starting Baadshah Gaming, it was inevitable that we would have liked to link the two businesses as one entity thus truly letting us be the “click and mortar” business that we wanted to build Baadshah Gaming to be. Casino Pride has been in the gaming industry for over a decade now and is a trusted name in the business with multiple properties in Goa, Nepal and Tbilisi, Georgia. Baadshah Gaming has always strived to ensure credibility and transparency in its operations, and with Casino Pride coming on board is a means that furthers that objective. PokerNews India: What are the challenges you face in running a live poker room in Goa? Madhav Gupta: As you might be aware most of the players who do come to play at Casino Pride are usually tourists and recreational players. Now as the majority of the clientele is from out Goa, the primary challenge is the acquisition and retention of players. Now at Baadshah Gaming Live onboard Casino Pride, we try to see that this challenge can be met by ensuring all players have a memorable experience when they play at Pride, be it in terms of services they receive and maintain their trust in the knowledge that the games we run are fair and credible. That has always been our number one priority and we will hope to continue to maintain the same. PokerNews India: Will the legalization of live poker affect business in casinos? Madhav Gupta: Personally, I do not particularly believe that legalization of poker in the different states of India will adversely affect the daily games running at Pride. As I have already mentioned, a lot of the players who do come and play with us at the Baadshah Gaming Live room are recreational players and not pros who have moved to Goa to take up the sport professionally and therefore, would probably return back to their respective cities should the game be legalized back home. Alternatively, I believe that should poker be legalized in different parts of the country, it would only help get more eyeballs on the game and help remove the stigma of gambling that is so often associated with the sport, and instead poker would then be more widely accepted for what it is – a game of skill. PokerNews India: Since you are running both online and offline poker rooms; what are the pros and cons of operating both? Madhav Gupta: So far as the pros go, it is fairly obvious that having both live and online platforms goes a long way in increasing our credibility among the poker community. Our live business has been running smoothly for almost nine years now, and with the online platform coming in, we definitely are not going anywhere. We are literally anchored in Goa, and with players getting the opportunity to play on both offline and online with Baadshah Gaming Live and the site, we hope that they feel more confident and comfortable knowing that their money is safe with us. A secondary advantage that comes with operating both platforms is that it gives us the leeway to try innovative ideas like the online Day 1A during the last BLT. Apart from that, it becomes easier to introduce players who exclusively play online to the live setting and vice versa by running different kinds of promotions. PokerNews India: Where do you see the Indian poker industry in the next 3-5 years? Madhav Gupta: India has always been a gaming nation and poker is bound to grow from strength to strength over the coming years. A very common example we see is the gradual shift from traditional games like Teen Patti and Rummy to Poker being played during Diwali. PokerNews India: What does the Indian poker market lack as compared to other countries? Madhav Gupta: The most glaring aspect that differentiates the Indian poker market when compared to other countries is the obvious lack of exposure. We have barely scratched the surface in terms of the number of people who know of or are even aware of the game. While there are a few players who are talented enough to compete with the best abroad, a vast majority of the players here are still learning the game. I believe that with more exposure there will be a whole lot of new players who will start playing the game. With different operators running various promotions, producing podcasts, videos and TV programs, the game will reach larger audiences, which eventually then might get us to the level that countries are at currently. While it may seem like a gradual process, it is only a matter of time before we get there.